Scientific research has uncovered the science that makes us happy. Happy people live longer , make more money, have better relationships and contribute more to society. 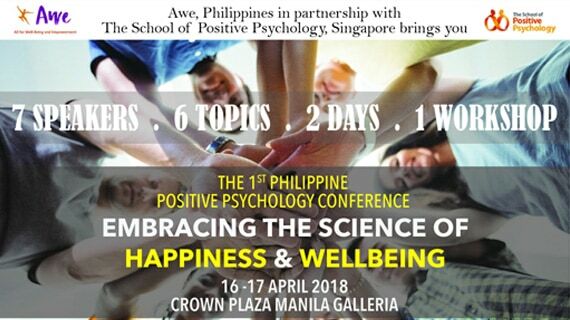 The School of Positive Psychology (TSPP) , Singapore and All for Wellbeing and Empowerment (AWE) ,Philippines are pleased to announce the 1st Philippine Positive Psychology Conference to be held on 16-17 April 2018 at the Crowne Plaza Manila Galleria. The conference theme EMBRACING THE SCIENCE OF HAPPINESS AND WELLBEING aims to educate on how people can apply the methodologies of positive psychology in various areas of human functioning. Learn from the leading authorities, psychologists and practitioners pioneering the research and applications of positive psychology include: Dr Robert Biswas-Deiner , Dr Gregor Lim-Lange , Sulynn Choong , Shaen Yeo and many more! This 2 days training will teach individuals the science that will allow optimal human functioning leading to flourishing lives.